A quality, no-frills piece of kit that does exactly what it says on the tin. Solid build, does the job it's built for. Some may not like the price. Many seasoned players own a battered old pedal they can't bring themselves to chuck out, despite the fact it hisses like a lispy python having a strop and generally makes a nuisance of itself. Noise gates are the answer to this problem and MXR's Noise Clamp is the latest addition to the ranks of no-nonsense noise-eliminators. "The Noise Clamp gets the job done with little fuss and - this is important - does so without messing with tone or overcomplicating things." 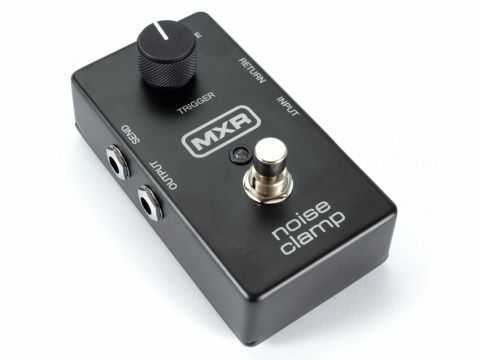 As with all MXR pedals we've seen, The Noise Clamp is a sturdy brute that looks like it'll take years of repeated pounding onstage. The sockets, Trigger control and switch are all of a similar quality, and it's black, which is proverbial for never going out of fashion. It's a straightforward piece of kit to get to grips with, featuring a single Trigger knob for setting the threshold at which the noise gate activates, a standard input and output, and a send and return for its own effects loop. Your effects chain is placed into the Noise Clamp's send/return loop, then you set the Trigger to kill noise, but retain note definition. After that, you can start getting used to playing in a hiss-free soundscape. The Noise Clamp gets the job done with little fuss, reduces noise by up to 26dB and - this is important - does so without messing with tone or overcomplicating things. Yes, it's £120, but the Noise Clamp is an unobtrusive and effective noise gate that mercilessly jumps on unwanted pedal noise without sapping all the life out of your tone. Switch it off and you'll wonder how you managed without it.